Today’s picture for Friday’s Fictioneers. The challenge: write no more than 100 words of fiction. He blamed her new hobby on their trip to Lyme Regis. She’d discovered a fossilized tooth on the beach beneath the giant cliffs. Since then, she’d developed what he deemed an unhealthy obsession. 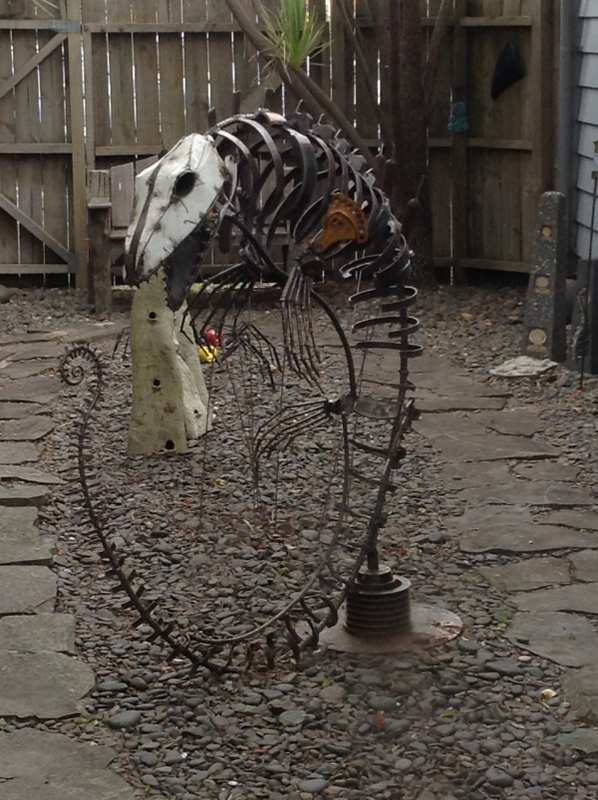 Instead of sculpting her usual angels or mermaids, she’d turned the backyard into Jurassic Park. Late into the night, she fashioned claws and teeth using nails and she pounded copper spikes into the shape of ribs, creating a new unidentified species. After that he didn’t mind the dinosaurs in the garden. For more fictioneers follow the link. Nice ending. Well done story! Thank you. I like a little twist. Great story. I’m not surprised she sold it! It seems like a one of a kind piece. It has presence, I would sell it. Not sure I’d buy it, but well done! I’d certainly sell it, not sure about the buying! And that makes all the difference. If it sells, it must be good. Nice story with a good interplay of characters and ideas. it’s funny how when a hobby brings a profit the naysayers calm down. Well done. So true. Writing started out as a hobby for me, now I’d hope it might give me a few pennies. The husband took some persuading! I envisioned a sinister ending to this tale. Thanks for leading me on to another ending. It felt like two stories in one package. I hope that makes sense. I get what you mean. I did debate having an unhappy ending, with him gone and the house full of dinos. Good story – and a similar ending to mine. Great minds think alike? Definitely. I think we both saw the commercial side of things. Inspiring place Lyme Regis! Good story. I visited once as a small child. I’d love to go back. Ha! Ha! Money trumps artistic objections in the end. Nice one. Money often does! Thank you.